The article, Whose Sarin?, was published in the London Review of Books on Sunday. If we believe Hersh and his sources, the pattern of deliberate lies is so pervasive, there is no reason to believe much of what we hear from the Obama administration without independent verification. Hersh begins by stating that we didn’t get the whole story from the administration when the president and Secretary of State John Kerry blamed the Bashar al-Assad regime in Syria for the chemical weapons attacks. The administration “omitted important intelligence” and “failed to acknowledge” that the Syrian rebels, the Al-Qaeda aligned Al Nusra group in particular, had chemical weapons capabilities. 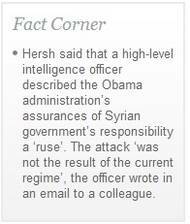 Hersh reports that the Operations Order contained information that Al Nusra had the ability to produce Sarin gas. Why weren’t questions raised about Al Nusra culpability after the August incident? Hersh doesn’t answer it directly, but there’s an obvious reason. Blaming the chemical attack on Syrian civilians provided the rationale for military action against Syria. That is the sole driving force behind the pattern of deception. More on that rationale later. Hersh makes the case for deception logically by reviewing sources of intelligence that could have tipped off the administration. The first was electronic listening in the office of Syria’s President al-Assad. The Syrian government apparently took sufficient countermeasures to stop this access, as Hersh reports. The mainstream media bought the Assad’s guilty story without any criticism, for the most part. The notable exception was McClatchy News, Washington Bureau. Hersh notes that a key McClatchy journalist, Jonathan Landay, was excluded from initial briefings on the chemical attack incident. Nevertheless, McClatchy investigated the White House claims with a critical eye: To some, US case for Syrian gas attack, strike has too many holes, Sep 2 The rest of the press followed the lead of the New York Times. Since 2011, the Obama administration had been demanding the departure of Syria’s elected President Bashar al-Assad. Citing human rights abuses, former Secretary of State Hillary Clinton made that clear from 2011 on as she traveled the world insisting that Assad must go. 1. Take advantage of a political clash between a used up/undesirable leader and some internal faction (the rebels). The Obama administration had achieved steps one through three in the Libyan formula. It took advantage of the Syrian political conflict and helped turn it violent by supporting its Middle East partners in funding violent action. It got the UN resolution condemning Syria for abusing protesters. But, the critical element was foiled at the United Nations by Russian opposition, a “no-fly zone” that worked so well in helping rebels in Libya. The chemical attack was a Godsend for the administration. The facts didn’t matter as much as the goal, winning the battle for the rebels and getting rid of Iran’s ally, the al-Assad government. That explains the fixed intelligence and the deception. Obama and Kerry didn’t get their attack. This infuriated rebels and their partners, Qatar and Saudi Arabia. Russian President Vladimir Putin threw the administration a lifeline just before one or both houses of Congress was about to turn down the president’s authorization for military action. Syria would give up its chemical weapons stockpile in the deal engineered by Putin. The Hersh article is a defining moment for the Obama administration and public confidence in the government, whatever little remains. Obama did what George W. Bush did on the Iraq invasion and what other presidents have done over the years – the administration lied to justify military action. The article deserves to be read widely and investigated further. There needs to be a consequence for this behavior, now not later. This entry was posted in Bioweaponry, Obama and Company, Region: Middle East, War and Peace and tagged obama deception, syrai, WMD. Bookmark the permalink. Obama is powerless. He thought he’d be the frontman. They forgot to tell him that he’s the fall guy. Pentagon’s traitor Israel-first rogue NSA runs Obama and the country.